Fabulous Beasts is going to Gamecity! Hey there! We’ve got some great upcoming plans for Fabulous Beasts to let you know about! But first, since I’m new here, I wanted to introduce myself. I’m Alex Wiltshire, and I’ve joined the Fabulous Beasts team to help get the word out about our little game. Hi! I was immediately intrigued when Alex (Fleetwood – hopefully this isn’t going to get too confusing) showed me what he’s been working on. I love Fabulous Beasts’ mix of physical and digital gaming because it combines things I love about boardgames, like pieces you can touch and sitting together with others, and things I love about videogames, like richly responsive visuals and intricate rules that you don’t have to calculate on the backs of envelopes (or have arguments over). I’m really excited to be a part of the gang. I am also very happy to be able to say that we’re going to presenting Fabulous Beasts at Gamecity in Nottingham next month. In fact, we’re kind of going to be launching ourselves as a studio, too. Gamecity runs from October 22 to 31; if you haven’t been before, I can’t recommend it enough as a fun, varied, city-wide celebration of games. We’ll have a setup where you can find out about and play the game, and on October 29 we’ll be holding a special event where we’ll demo the game over tea and toast and explain our vision for Fabulous Beasts and beyond. We really hope you can come along! And that’s not all! Over the week of Gamecity, we’ll also be holding a tournament for the prize of Fabulous Beasts World Champ 2015. Imagine holding that trophy aloft, the first-ever holder of a title for a future e-sport! So we’re looking for a special few entrants. If you’d like to take part, let us know! We promise you’ll find it fun/challenging/competitive/richly rewarded! We’ll follow up with a fuller plan very soon, as well as news of another event we’ll be taking Fabulous Beasts to soon. Hey, you can sign up to our newsletter for news, if you like. 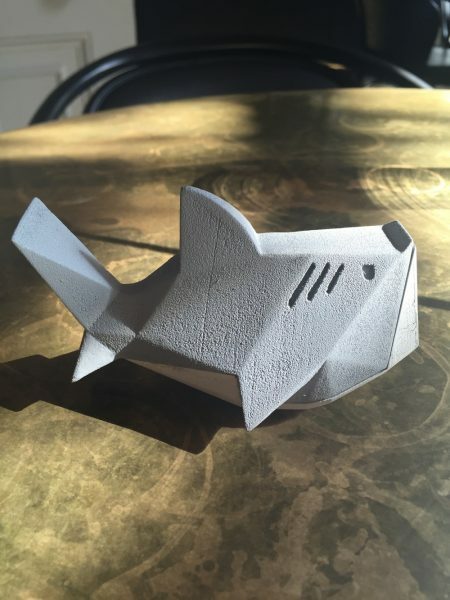 In the meantime, here’s a picture of the latest creature off the press, a delightfully snooty shark.